The Kruse Limited Temperature Cycle is an isothermal extension of the Otto and Diesel Cycles and is put into practice in direct injection, spark ignition or compression ignition, internal combustion engines. More detail is provided in the Kruse Technology section, but the essential difference between the cycles is that fuel is injected in multiple increments both before and after the point of ignition. 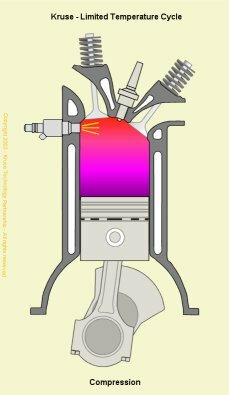 Injections of partial quantities of fuel prior to ignition reduce the temperature of combustion in the cylinder and injections afterwards ensure that maximum power can be extracted from a given quantity of charge air. 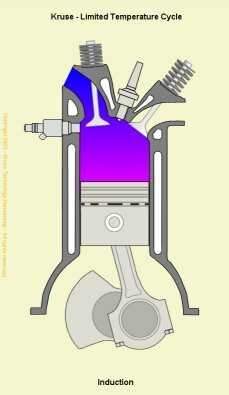 At this point in the cycle, the inlet valve is open and the exhaust valve is closed. 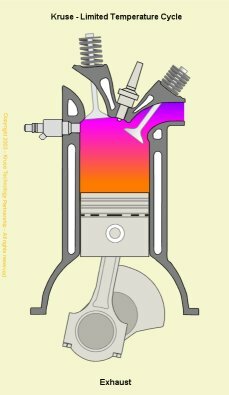 As the piston travels down the cylinder, a new charge of air is drawn through the inlet port into the cylinder. From a theoretical perspective, each of the strokes in the cycle complete at Top Dead Centre (TDC) or Bottom Dead Centre (BDC), but in practicality, in order to overcome mechanical valve delays and the inertia of the charge air, and to take advantage of the momentum of the exhaust gases, each of the strokes invariably begin and end outside the 0, 180, 360, 540 and 720 (0) degree crank positions (see valve timing chart). An initial quantity of fuel is injected into the cylinder early in the stroke to ensure that there is a good fuel and air mix. In addition, this reduces the temperature of the mixture through the vaporization of the fuel and has the corresponding benefit of reducing the work of compression. Towards the end of the compression stroke, a second quantity of fuel is injected into the cylinder. This is directed towards the sparking plug to ensure that there is a chemically correct fuel/air mixture surrounding the plug when the spark event occurs. 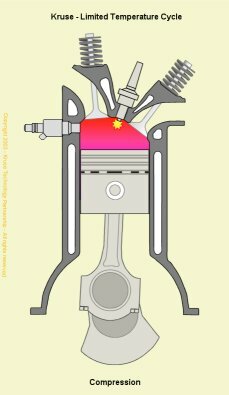 Spark ignition takes place when a spark generated at the sparking plug ignites the fuel/air mixture in the cylinder. Directly injecting fuel towards the plug lowers the lean misfire limit experienced with normally carburetted or port injected systems and thus improves fuel efficiency under low load conditions. The figure also illustrates that due to flame propagation delays, spark ignition timing commonly takes place before TDC. The power stroke begins as the fuel/air mixture is ignited by the spark. 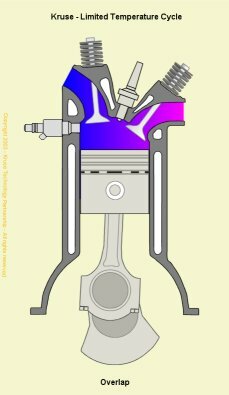 In current production engines, the total fuel quantity for a particular engine cycle will have been injected into the cylinder by this time, but by pre-determining the peak combustion temperature and controlling this with the quantity of fuel injected prior to ignition, the LTC allows for a third sequence of injections to achieve maximum power from the remaining charge air (oxygen) in the cylinder. 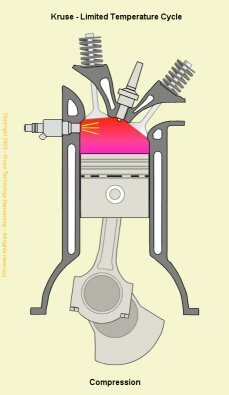 The exhaust stroke is as critical to the smooth and efficient operation of the engine as that of induction. As the name suggests, it's the stroke during which the gases formed during combustion are ejected from the cylinder. This needs to be as complete a process as possible, as any remaining gases displace an equivalent volume of the new charge of fuel/air mixture and leads to a reduction in the maximum possible power. Tuned exhaust manifolds help to maintain the momentum of the gas during the stroke to assist in the removal of the exhaust gases. They can also be tuned within the maximum power rev range to create reflections or standing waves at the exhaust port to prevent some of the charge air from disappearing through the exhaust port during valve overlap (see below).